Shuck corn and remove silk. Trim any bad spots off. Wash corn. Warm skillet and add butter. Keep on low while preparing corn. Cut the tips of the "kernals" into a bowl, then scrape the cob (the remaining juice under the kernals) into the bowl. Turn burner up to medium. 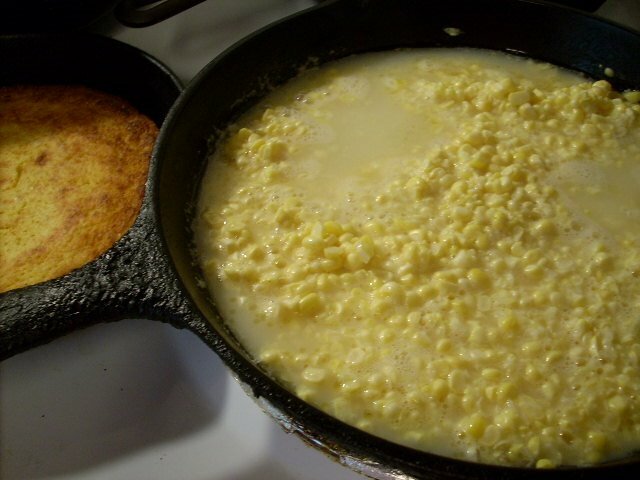 Place corn into skillet and add about 1 /2 cup water, salt and pepper. Stir and cover. You want it to simmer. Watch carefully and stir occasionally to prevent sticking. You may need to add a little more water if it does. Cook until it is slightly glossy looking and thickened, approx. 15-20 minutes. *If it is watery or doesn't thicken then the corn wasn't very starchy or you may have added a little too much water. You may thicken it by adding 2 t. corn starch mixed in a little cold water, then stir into corn. Taste to see if done. Turn down to lowest temp. to keep it warm until mealtime. Serves 6.